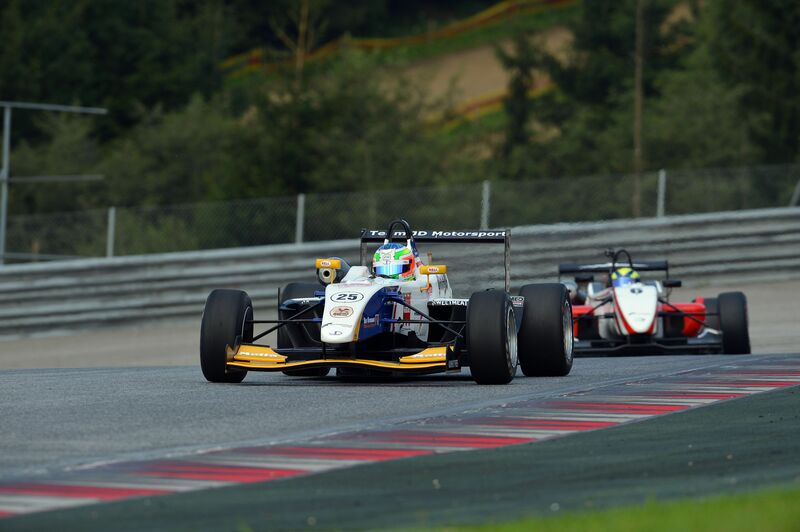 JD Motorsport's driver did not concede anything to his rivals and obtained a double pole position on the Austrian circuit which yielded him two more points for the classification. Eddie Cheever was twice second while Nicholas Latifi and Brandon Maisano got respectively the third place in the first and second session. Qualifying one decided the grid valid for race one and Agostini set a quickest lap in 1'26''843, which was more than half a second faster than Eddie Cheever's time,the European classification leader driving for Prema Powerteam. The second row of the grid will be occupied by a surprising Nicholas Latifi, Canadian in force at JD Motorsport who confirmed the good progress obtained at the wheel of the car belonginf to the team of Vespolate. Mario Marasca will be at his side on the BVM car as he proceeded the Frenchman of Ferrari Driver Academy, Brandon Maisano. Only 62 thousands of a second separate Latifi in third and Maisano, fifth, which shows a high competitiveness that will be reflected in this afternoon's race. The third row will be completed by Kevin Giovesi, on the Dallara lined up by team Ghinzani. The Milanese driver at his second race of the season proceeded Henrique Martins (Prema) and Sergey Sirotkin (Euronova). The Swiss Solo Patric Niederhauser, BVM, was only ninth with a best lap of 1'28''530. The fifth row will be completed by the second Ghinzani's driver, the Romanian Robert Visoiu, that ended at less than a second from Cheever's time. In fact, only 1.1 seconds is between the second and the tenth position. Yoshitaka Kuroda follows with the Dallara of team Euronova. Race 3 grid will see again Agostini on top as he set a quickest time of 1'26''816, while Cheever is 2 tenths adrift with a best time of 1'27''091. Third place for Brandon Maisano (Prema), who managed to get the second row ahead of Nicholas Latifi (JD Motorsport). The third row went to Kevin Giovesi (Ghinzani) and Henrique Martins (Prema). Six drivers ended up in less than a second with the stunning performance of Agostini and Cheever that announce great battles in the race. Mario Marasca was seventh at 13 thousands from Martins and one tenth clear of Euronova's Sergey Sirotkin. Patric Niederhauser was only six thousands shy of the Russian driver instead. Robert Visoiu (Ghinzani) followed in tenth at 1.3 seconds from the qualifying leader Agostini, while Yoshitaka Kuroda was again in the back. Race one will start this afternoon at 14.40 (GMT+2) with live coverage on TV on Rai Sport 2 and web streaming at www.acisportitalia.it/F3.